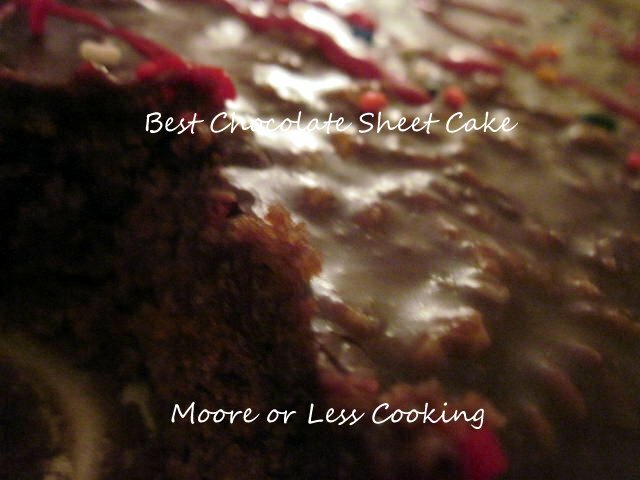 This really is The Best Chocolate Sheet Cake~ Ever! So chocolatey and rich! You will be hearing moans and groans from anyone who takes a bite! It’s Judy’s Surprise Birthday and I have been wanting to make this incredible cake ever since I saw it on The Pioneer Woman Cook’s Blog. She says it’s The Best Sheet Cake Ever, and I trust her. Everything that I have made from her blog has been delicious and my kids have asked me to make it all the time! Well she was right! Friends were going back for second and third pieces! I wanted to make a delicious cake for Judy and her friends, since I didn’t know how many people were going to be there to surprise the HECK out of her, I thought that a sheet cake would be perfect! I read every single one of the comments on TPWC Blog, which is saying a lot ( she usually gets around 800 comments or MORE per post) and so many people commented that this cake was really difficult to mess up. I thought of this the whole time that I was talking to my best friend while trying to make the cake and frosting. Do you ever do that? Leave out an ingredient while you are having a serious conversation on the phone? I have, sugar, while making pies, not good at all!I didn’t leave out any ingredients for this cake, but my mind was really concentrating on two things at one time. I recommend this if you are feeling lazy and need to be challenged! 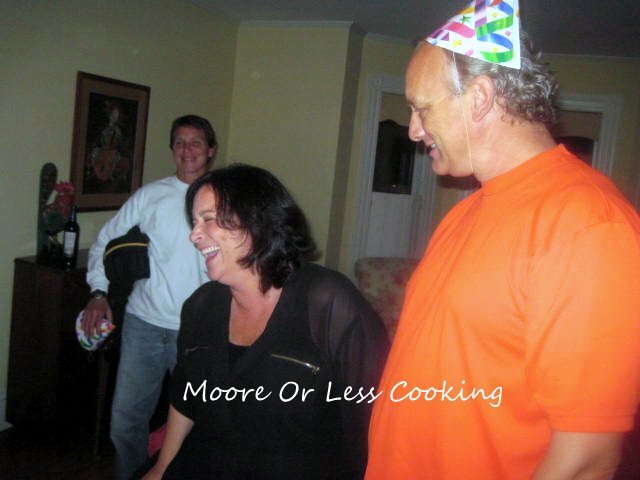 Talking and Baking! 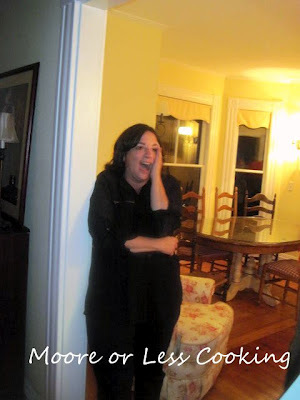 As we were all hiding waiting for Judy and Tom to come back from their date night, Judy’s Mother called Judy from the back room asking her if she could show her something on the computer, the lights were off, we were quiet as mice, we all jumped out and yelled SURPRISE!! Thank goodness, Judy is young and has a very strong heart, I would have collapsed, don’t yell at me and come jumping out at me from a dark room, years will come off my life! You are an amazing sport Young Judy!! Judy still trying to recover, you did a great job Tom keeping it a secret! Note: I use an 18x13 sheet cake pan. In a mixing bowl, combine flour, sugar, and salt. In a saucepan, melt butter. Add cocoa. Stir together. Add boiling water, allow mixture to boil for 30 seconds, then turn off heat. Pour over flour mixture, and stir lightly to cool. In a measuring cup, pour the buttermilk and add beaten eggs, baking soda, and vanilla. Stir buttermilk mixture into butter/chocolate mixture. Pour into sheet cake pan and bake at 350-degrees for 20 minutes. Add cocoa, stir to combine, then turn off heat. Add the milk, vanilla, and powdered sugar. Add the pecans, stir together, and pour over warm cake. Hi Bibi!Let me know what you think, this really is the BEST!! YUM! That looks good and I am glad that you linked up… Also glad that you noted it would be good for breakfast as when I do make this and eat it for breakfast I am going to tell my husband that it is written in the recipe :). Thanks for sharing on Foodie Friends Friday and for following me… I had thought you were already too but I have noticed that some of the blogs that I had been following I am not anymore ~ maybe someone is telling me something :). Nettie this sounds fabulous, I've never gone wrong with a Pioneer Woman recipe either! What a fun surprise for your friend. Who says only kids should get to celebrate birthdays! I'm featuring this at this weeks Thursday's Treasures, thanks for sharing. Pinned. I can’t get it to print out. Okay I will check on that for you. 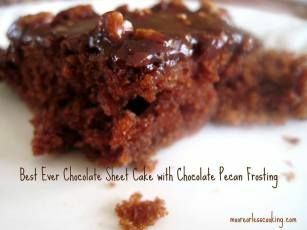 I am wondering if you can bake it in a 9X13 this is identical to the recipe I have been using for years. A while back I saw one that was baked in an iron skillet I printed it out to see what the difference would be. They are all good it is the chocolate fudge that makes it all …I use Vietnamese Cinnamon in mine when mixing and when done and on the plate add a dollop of vanilla ice cream! I use this recipe all the time. I add 1 teaspoon of cinnamon in the batter. Gives it just a hint of difference to the chocolate! G’day and YUM! WISH I could have a slice of this right now! I make this cake at least 12 times a year, it is so good. Instead of using water I use coffee, in the cake and (in place of milk) frosting. I also use dark chocolate I am not kidding it really enhances the (coffee) chocolate flavor. This is a best seller at my house. I get asked to make it a lot. Like you said you can eat 3-4 pieces easy…….. I have to try that next time I make this cake psl2010. Thank you for the tips! You could, I haven’t tried it, but if the measurements are the same, it should work.